wants to know Robin Robinsons work out routine - she looks great! Is this lady in the turbun a terrorist? Anne Hathaway is giving me life. I heard that Jennifer Lawrecne tripped on the carpet...that poor thing is always tripping! What happened to Ryan Seacrest? E isn't showing anything live anymore? I tuned in a little while ago - did you guys talk about Liza Minelli yet? OMG the lips, the filler all over the face...!!! I don't think E! Can be on the carpet live once ABC telecasts. Ummmmm.... Who thought Kristen Cavaleri was a good idea? Ryan Seacrest just started another new job, he had to punch in on the time clock. Who's wearing the best dress my 107 gang? Did anyone catch Access Hollywood ? 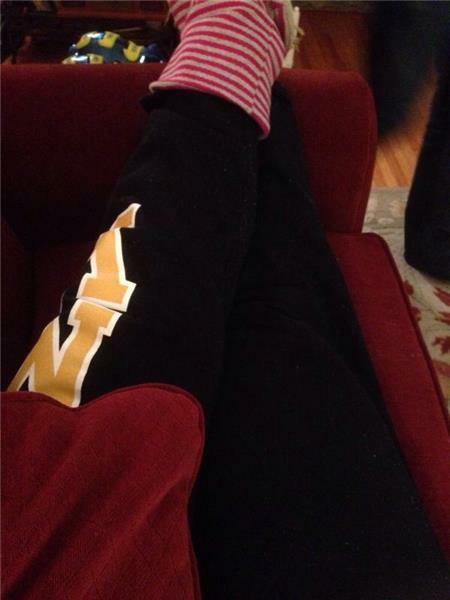 Sweats and well loved slippers on the red couch. That's my #oscar fashion. What's yours? Jason and Bradley ...you need to do a show together! I love Lupita's dress. I don't like her jewels + headband? Jl fell because of a cone? Showing Jennifer tripping again on E!